This week sees the start of a run of monster beers from breweries I know and love – in this instance Marble, who were the subject of one of my Tours-At-Home and were broadly judged to be lovely. So, when my regular online beer pusher – ahem, sorry, supplier – mentioned on Twitter that they had some rather special Marbles coming in, I took that as a sign from the Gods (and a jolly good excuse) to place an order. 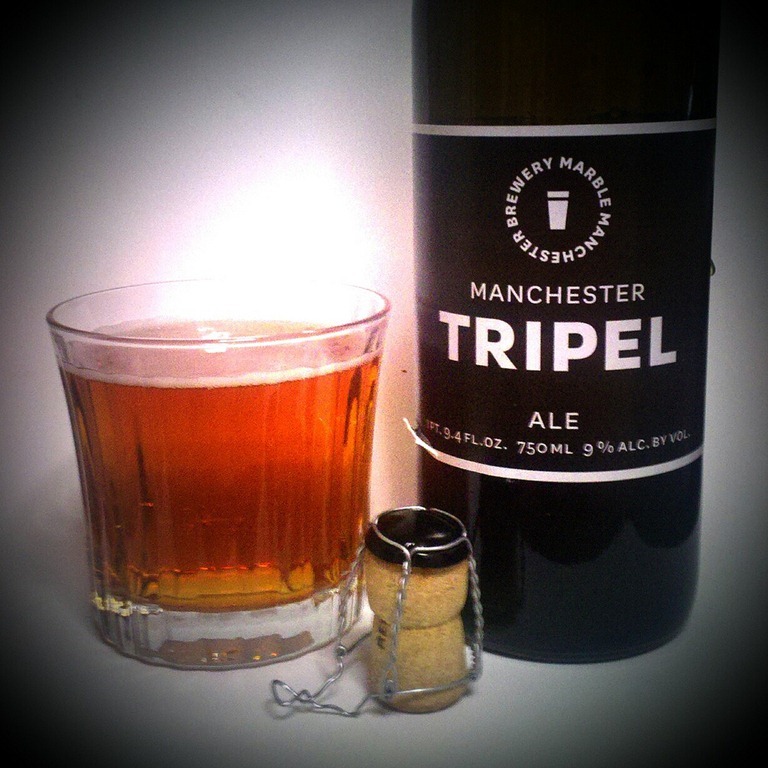 Marble Tripel comes in a rather large 750ml bottle, which is generally a good thing for a beer, but which is a little daunting when the beer in question is 9.0%. Still, it’s a challenge I’m willing to take on! The first thing that hits you after carefully easing out the champagne-style cork is an impressive waft of sweet grapefruity hops. It pours a nice rich amber in the glass with some fine, lingering bubbles and after some time in the glass the hops have slightly faded allowing for some of the sweet slightly caramel hints to appear. The first impression in the mouth is of that sweetness, along with a really pleasant, almost creamy texture that comes from those fine bubbles. As the sweetness is washed away by a surprisingly understated alcohol there’s a hint of something vineous with dried fruit and raisins, before leading into a long, rich, warming finish that balances off wonderfully against the big hopped bitterness. I honestly can’t think of the last time I had a beer whose flavour changes and evolves so much as it sits on your tongue; every mouthful is a joyous journey from sweet caramelly malt through a gentle warming alcohol and out to a strong but perfectly judged bitter hop kick. I’m tempted to say that this is the nicest beer I’ve had from Marble, and that’s saying something. 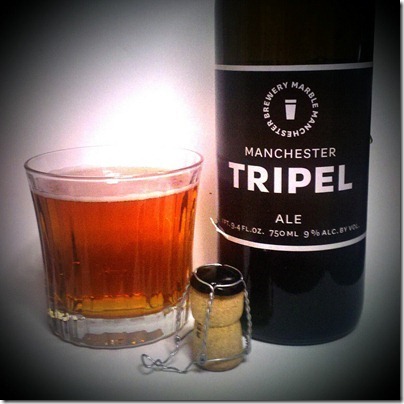 Despite their lack of Belgiumness, Marble seem to have delivered a definitive Tripel, pale, strong, hoppy and utterly delicious. Suddenly that 750ml bottle looks almost too small. what you have here is a cracking review of a cracking beer – one of my favourite beers, keep on!